With Halloween rapidly approaching, ‘tis the season of all thingy spooky. Here are ten pictures of ghosts captured around the world. If you didn’t believe in ghosts before, perhaps you will now. In this photo, a mystical figure can be seen on the top of the stairwell. Could this be a ghost? We’ll let you be the judge. This ghost is known for wearing a brown brocade in several sightings at the Raynham Hall in Norfork, England. She was nicknamed “The Brown Lady” after this picture was released in Country Life magazine during the 1930s. The first sightings of this ghost date back to the 1830s. Several guests reported seeing the ghost at the hotel on multiple occasions, and the ghost even lead to some hotel staff leaving permanently. This next ghost was spotted at the Combermeme Abbey Library in 1891 by Sybell Corbet. As clearly seen, half of the man’s body is sitting in the char to the left in the photo. People now refer to this as the ghost of Lord Combermeme, who was a British commander in the early nineteenth century. He was a very prominent official in the military at the time. Interestingly enough, he eventually became Governor of Barbados and gained notoriety for moving coffins to different locations. He passed away in 1865, but this picture will reap fear in the hearts of many forever. This next picture shows the ghost of Freddy Jackson, taken in 1919. Sadly, he was killed in an airplane propeller accident two days prior to when this photo was taken. Yet, in the back row, four people from the left, you can clearly see his head sticking out. None of the other squadron members saw him when that photo was being taken, so to see him in the back could not have been anymore shocking. Even more oddly, his funeral was that same exact day. This next ghost was first spotted in 1963 at Newby Church in Yorkshire, England. As seen, the ghost has one of the most stereotypical ghost faces most are accustomed to. The ghost was not visible to the naked eye, only in some pictures. 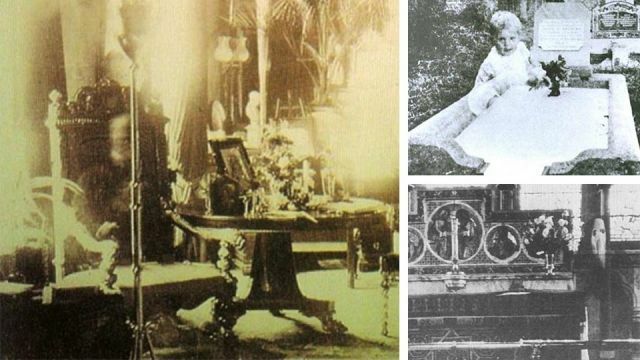 Photo experts have debunked theories that the ghost is only in pictures because of a “double exposure” problem with the camera. That church had been around since the late nineteenth century and never had any prior history of ghosts. The ghost in the image is estimated to be a formidable nine feet tall! This ghost was spotted in Queensland, Australia in 1946. A woman, who was referred to as Mrs. Andrews, was going to a cemetery to see her daughter’s grave. After she got the image developed, she was in utter disbelief when she saw the ghost. When doubters said it was just a double exposure issue, Mrs. Andrews fiercely argued that there was no other kids nearby. The woman also claims that the baby looked far different than her child. This photo was taken at the Fleet Air Arm Station in Yeovilton, Somerset, England. At first, the woman thought it would be cute to take a picture of her sitting in the front of a helicopter. No one was sitting next to her when the picture was taken, but as can be clearly seen, a figure is seated next to her. Also, the woman notes that she felt extraordinarily cold sitting in that seat, despite it being incredibly hot outside that day. It is not known whether a pilot died in that aircraft. This ghost could not be any more eye opening for non-believers out there. It was taken by graphic designer Neil Sandwich in 2008 in Hertfordshire, England, in what was supposed to be a harmonious wedding photo event. The ghostly, white figure appears to be a child peeking past a wall. #FarmGhost they say its real… it eats all the animals in the farm and only appear at night… what do you think Fact Or Fiction…. See those eyes in the left upper corner of the photo? Yes, that would be a ghost known as the Amityville Ghost. This was spotted in 1974, at a house where a madman murdered his father, two brothers and sister. Years later, a family bought the home because they loved the garage, pool and waterfront location. However, they reported seeing paranormal activities like slime coming out of keyholes. Eventually, due to the utter creepiness, they were forced to move out and hired a investigation team to search it. During their search, they were able to capture this frightening photo. Last, but certainly not least, is the Tulip Staircase Ghost. This historic looking picture was taken in 1966 in Canada at the queen’s house. A retired couple traveled there due to rumors of the house being haunted. While standing next to the Tulip Staircase, the husband took a photo. After it was developed, the couple noticed the ghostly figure. The stairs have a “no admittance” sign and the ghost is supposedly a maid who died nearly 300 years back. Do you believe in ghosts? Did these photos help convince you at all? Let us know in the comments! Hey Buddy!, I found this information for you: "10 Photos That Will Convince You Ghosts Are Real". Here is the website link: https://www.thealternativedaily.com/photos-that-will-convince-you-ghosts-are-real/. Thank you.